Exams » CBSE (VI - XII) » CBSE Syllabus For Class 8 Hindi: Check Out Detailed CBSE Class 8 Hindi Syllabus ! CBSE Syllabus For Class 8 Hindi: The Central Board of Secondary Education (CBSE) is one of the largest boards in India. CBSE conducts the Class 10 and Class 12 board exams for schools affiliated to the board. As for the annual exams for students of Class 1 to 9 and Class 11 in CBSE affiliated schools, the respective schools are responsible for them. However, CBSE sets the guidelines for how the exams are to be conducted for these Classes in schools affiliated to the board. Also, CBSE prescribes the syllabus and books which are to be referred by the students of Class 1 to Class 12 in CBSE affiliated schools. As per CBSE’s guidelines, Hindi is one of the compulsory language subjects till Class 8. It is, therefore, important that students have a clear idea about the CBSE syllabus for Hindi. This will ensure you do not skip any chapter. Having a good command Hindi (both reading and writing) could be helpful in the future. In this article, we will provide you with the detailed CBSE syllabus for Class 8 Hindi. Read on to find out. This covers almost all the aspects of CBSE Class 8 Hindi Syllabus. Make sure finish them on time. Class 8 subjects must be taken seriously because these will lay the foundation for you. If your basics are clear, you won’t face any difficulty in higher Classes. The various concepts and topics included in CBSE Class 9 and Class 10 syllabus are related to that of CBSE Syllabus for Class 8. It is, therefore, important that you finish the Class 8 syllabus thoroughly. At Embibe, you can solve CBSE Class 8 practice questions and take CBSE Class 8 mock tests for Science and Maths. These will improve your problem-solving abilities, time management and prepare you to face not just your annual exam but also various competitive exams. 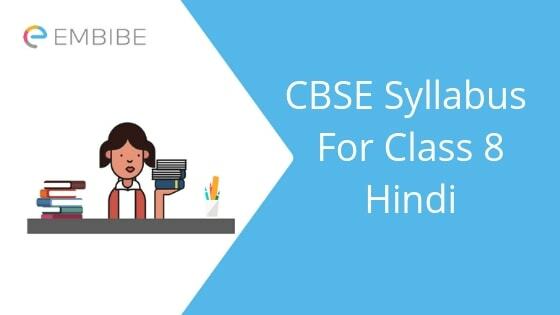 We hope this detailed article on CBSE Class 8 Syllabus for Hindi helps you. If you have any question regarding CBSE syllabus for Class 8 Hindi, drop a comment below and we will get back to you at the earliest.